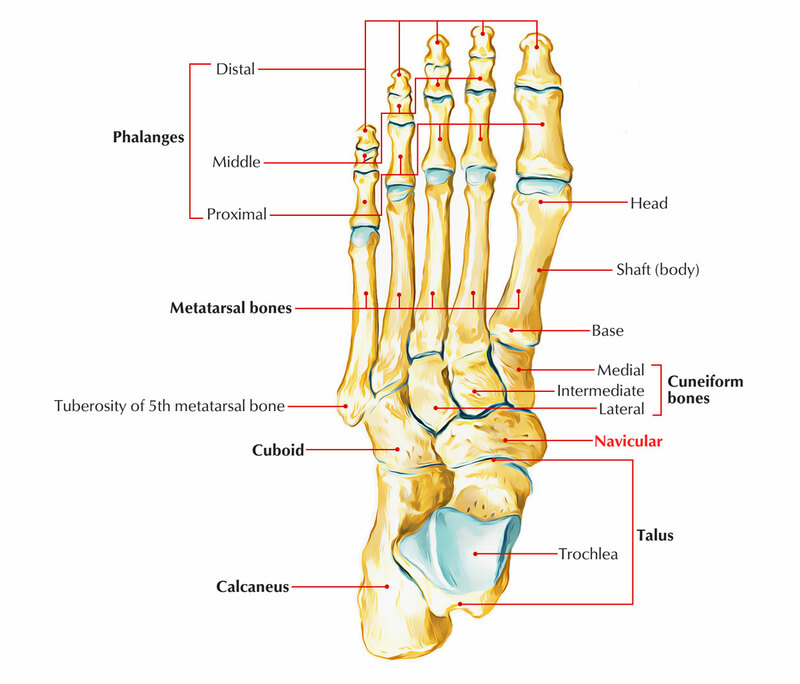 The Navicular Bone is boat-shaped. It is situated on the medial side of the foot, in front of the head of the talus, and behind the three cuneiform bones. The anterior surface is convex, is divided into three facets for the three cuneiform bones. The posterior surface is concave and oval for articulation with the head of the talus. The dorsal surface is broad and convex from side to side. It is rough for the attachment of ligaments. The plantar surface is small and slightly concave from side to side. It is rough and non-articular. The medial surface has a blunt and prominent tuberosity, directed downwards, the tuberosity is separated from the plantar surface by a groove. The lateral surface is rough and irregular, but frequently has a facet for the cuboid. The tuberosity of the navicular bone receives the principal insertion of the tibialis posterior. The groove below the tuberosity transmits a part of the tendon of this muscle to other bones. The plantar surface provides attachment to the spring ligament or plantar calcaneonavicular ligament. The calcaneonavicular part of the bifurcate ligament is attached to the lateral surface. To the dorsal surface are attached the talonavicular, cuneonavicular and cubonavicular ligaments. It ossifies from one centre which appears during the third year of life.